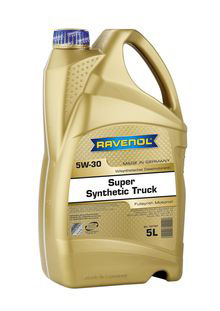 RAVENOL Super Synthetic Truck SAE 5W-30 is a fully synthetic, diesel saving “Low SAPS” lorry motor oil based on the latest additive technology, with very special base oils. It was developed specifically for diesel engines under extreme conditions for use in any season. Excellent for use in EURO 4 and EURO 5 engines along with low-sulphur diesel. RAVENOL Super Synthetic Truck SAE 5W-30 is suitable for use in engines with or without particle filter and catalytic converter. RAVENOL Super Synthetic Truck SAE 5W-30 is an all-season Low SAPS high performance commercial vehicle motor oil fine tuned for the new exhaust emission directives. All-season use in EURO IV and EURO V engines. RAVENOL Super Synthetic Truck SAE 5W-30 is suitable for oil change intervals according to manufacturer specifications to over 100,000 km. Outstanding detergent properties, no residues in the engine. Outstanding dispersing properties – prevents cold sludge and residue formation. Extends the life of the particle filter by reducing the tendency to form particles. Low sulphate ash-, phosphorus- and sulphur content “Low SAPS”. Outstanding high temperature stability, high viscosity index. Low fuel consumption for cost effectiveness.